Identifying doll marks are usually found on the the back of dolls neck, upper or lower back and possibly on bottom of the foot. Barbie doll markings are excluded from this page, instead see our Barbie Doll Marks page, all other vintage Barbie, family or friends marks are found on each individual doll page, see the Barbie Dolls 1959+ page. 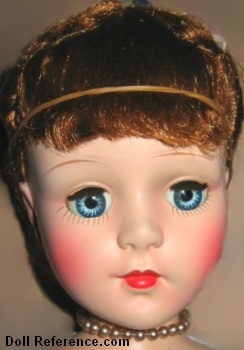 Additional doll markings can be found on each doll manufacturers page, as well as by material made of pages. 14-5W - Eegee Baby Susan doll, 14-15"
15BALHH - Belle Doll & Toy Corp.
2112 - Allied Grand Doll Company, Inc.
AE 593 - Belle Doll & Toy Corp.
E 33 - Elite Creations, Inc.
E 43 - Elite Creations, Inc.
P 8 - Belle Doll & Toy Corp.
P 16 - Belle Doll & Toy Corp.
Bal Dolls Inc. - made by Bal Dolls, Inc.
Eppy 1964 Pat Pending - Eppy Doll Co. P.M. Sales Inc. 19©66 - Paula Mae Sales, Inc.
Irwin inside a flag, inside a circle, Made in USA. - Irwin & Co.
Star with Hollywood Doll inside - Hollywood Doll Co.
Ae, AE - Allied Grand, American Character, Belle Doll & Toy Corp., H.J. Blumberg, Deluxe Reading & Topper Toys, Eegee, Mary Hoyer, Jolly Toy Nasco, New Dolly Toy Company, Plated Molded Sales, Inc. Schoen & Yondorf, Valentine, Unique Doll Company. E - Elite Creations, Inc.
EI, E1 - 7" dress me doll, possibly by Elite Creations, Inc.
Evergreen Made in Hong Hong - Evergreen Doll Co.
GMFGI - General Mills Fun Group, Inc.
H. Garfinkle - Wonderama Toys, Inc.
KT - Allied Grand Doll Company, Inc.
LGT, L.G.T.I. - Lewis Galoob Toys, Inc.
M.I.I. - Meritus Industries, Inc.
STRACO - F.J. Strauss Company, Inc.